Gas fumes and fried food smells wafted through the Texas gas station where my daughter stood, counting her coins to see if she had enough money to buy both the king-sized candy bar and the bag of gummy worms. It turns out that she did not. We were on a road trip and she had looked forward to buying her own treats at gas station stops, with the allowance money she’d saved up. Now her money was running out. Perhaps this was a great lesson in generosity, but definitely not a great lesson in consequences. 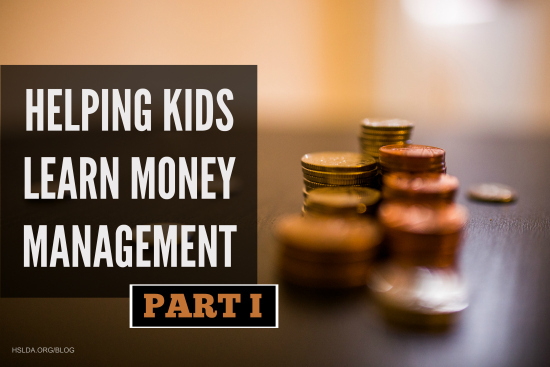 This little story aside, we generally do see our kids learning a lot of valuable lessons in money management because we have given them a small allowance and have attached spending responsibilities to the money they receive. Several years ago I read the book Raising Money Smart Kids and learned a few things that we have since implemented. First off, the author Janet Bodnar recommends giving an allowance to kids but also making it known that it’s not “free money.” There are definitely spending responsibilities and expectations attached. Some people suggest that kids should only get an allowance if they do corresponding chores. There are two problems with this. First, kids should do chores because they are part of the family, not because their parents pay them for it. Secondly, it’s a logistical nightmare to try and figure out every week if Johnny did these four chores but not those two chores. And if Johnny has siblings to keep track of too, then forget it! Having said that, there are occasionally extra chores, outside of the parameter of my kids’ general responsibilities, that I will offer to pay them for. And when they do those chores, like vacuuming my mini-van or watching the toddler for me so I can get something done, then I pay them for that immediately. I hope that this helps them to learn that hard work will pay off and they can take initiative to earn more money. Those are good lessons to learn, too. We also will fine our kids periodically, with advance warning, if we have to pick up stuff they have left on their floors or if they didn’t make their beds. For a while, we tried to pay allowance monthly. But that didn’t work at all. We had a hard time being consistent. Also, even though it was just a small amount per month, it still seemed like too much money to give a little kid. It was almost like we “saved” the money for them each month and gave them too big of a lump sum, so they never had to save for themselves. This problem was solved by giving the kids a weekly allowance instead. I set the alert notification on my phone to remind me to pay allowance every Friday afternoon. I went to the bank and got a roll of quarters, a roll of dimes, and a roll of nickels, so I would be ready to make pay roll. The kids are paid mostly in coins, and they can trade up for dollar bills, after they have saved up. As far as the amount we pay, our kids each get a quarter per year old that they are, each week. So my nine-year-old gets $2.25 a week and my seven-year-old gets $1.75 a week. The kids are required to give ten percent, save ten percent, and have enough on hand to fulfill their spending responsibilities (or, of course, go without, if they don’t have enough). 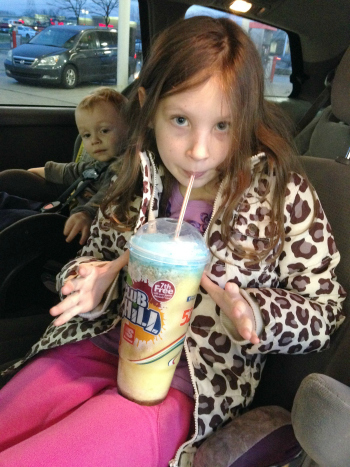 Currently, our kids’ main spending responsibility is to buy their own treats when they are out, unless we have specified that we will buy the treat, for a certain family outing. They also have to buy their own toys or other “extra” stuff, except for what we get them for birthdays and Christmas. Good lessons are being learned because of this except, of course, when sweet Texas gas station ladies bail them out. This is a two-part series. I will have more to say about allowance and teaching money management next time. Photo Credit: First photo graphic design by Charity Klicka; second photo by Amy Koons, CAP: Clara with a gas station treat. ← Encouragement for B.O. (Born-Organized) Moms … yep, you need it too!